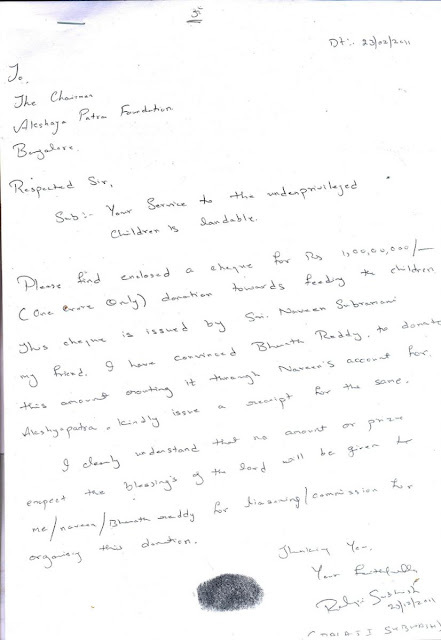 ISKCON Mumbai is engaging a criminal and blackmailer in defaming ISKCON Bangalore. Please find the link below to the excerpt of the news video in which the Varada Krishna Das and Balaji Subhash have been caught red handedly in a conspiracy to blackmail ISKCON Bangalore. Balaji Subhash is a professional black mailer. He was taken by Varada Krishna Dasa to Mayapur and conspiracy was hatched between him, Varada Krishna Dasa and Dayarama Dasa sitting in the pent-house of Dayarama Dasa at Mayapur. An offer was made for Rs 75 lakhs ( in a recorded speech) to Balaji Subash to create some fabricated incriminating video and give it to the press so that Akshaya Patra would lose tax exemption for its donations. The evidence of this has been collected by Criminal Investigation Department (CID), Special Police wing of Bangalore Police. The offense was the prima facie, found to be so serious that the Director General of Police ( the highest police official in the state) ordered the case to be transferred from local Police Station to CID branch. He used to meet ISKCON Bangalore’s preacher Acharya Ratna Das several times basically to get lot of conversational clippings over few months and shot video through the hidden camera discussing the subject matter of bring big corporate donations to Akshaya Patra and he talked about percentage commission to the person organizing the donation. Of course Acharya Ratna Das flatly refused any commission. Towards later stages the temple authorities got doubt that this guy was being set by ISKCON Mumbai and Jai Chaitany Dasa played up with his scheme to make him bring the cheque. Soon he fell for the trap and he brought a bogus cheque of Rs 1 crore as donation. Sensing a definite foul play Acharya Ratna Dasa insisted a written letter to the foundation that no commission or liasoning charges would be paid and that it was done out of devotion only and made him even put a thumb impression lest he denied his signature. The cheque itself was not his but somebody else’s cheque signed by him. His idea was to give the cheque and then say that the temple went back on our promise to give commission and so he asked bank to stop payment for the cheque and make an issue of temple giving commission for corporate donations. Now he was stuck, giving a cheque as well as the letter written in his handwriting stating that he organized the donation out of devotion and did not want any commission or liason amount for the service. The temple presented the cheque and it was returned from bank for insufficient funds , which in itself is a criminal offense. Meanwhile he started calling the temple and demanded extortion money and by showing fabricated video clippings by editing and pasting and morphing in such a way as if temple is offering kick back for corporate donations. One day he had actually fixed an engagement with the media and was about to release the fabricated video and by a very strategic move it was averted though it cost the temple some money later fully recovered from him through the police. On a complaint from the temple for extortion and blackmailing, the police silently tracked his movements for over ten days and finally he was arrested. The Police seized lot of electronic equipments and lot of fabricated video clippings with the intention of extorting money as well as deceiving public. He was kept in lock-up and prison for 32 days after which he was released on conditional bail. Alas it is so sad that ISKCON Mumbai has degraded to this non-brahminical platform. Misinforming media, spinning people against ISKCON Bangalore, engaging people to write in incognito names and now using black mailers to defame Srila Prabhupada’s temple are the ways and means of ISKCON Mumbai to bring down the preaching of Lord Chaitanya’s movement. Every activity what a criminal can think of is what they are doing. Is this what these DEVOTEES learning from their self-proclaimed gurus? Is this called a Vaishnava behavior? It is a shame indeed.